The DTAKIT provides the solution for disabled toilet alarm facilities on our Care2 EVC (emergency voice communication) system. 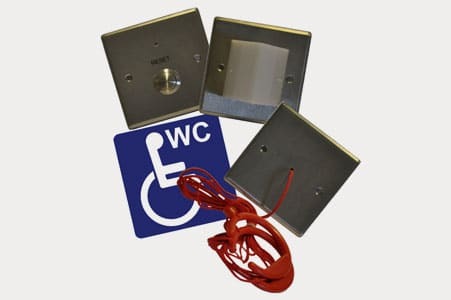 Adding disabled toilet alarms to an EVC system provides the ability to monitor activity on these points as well as two-way communication with the standard outstations on an EVC system. The three-part kit is available in a white finish and fully conforms to BS8300:2009 requirements. BIM (Building Information Modelling) objects are available for both of our EVC systems, including the disabled toilet alarm components. If you would like copies of these please see ‘Further Information’ at the bottom of this page. Pull switch: ceiling mounted pull with two ‘G’ pulls. Reset point: reset button (and LED) to reset calls locally. Light/sounder: Overdoor triangular lens with integral sounder to attract attention. WC sign: Self adhesive, vinyl, disabled toilet sign. The DTAKITs are connected directly to the control console. Up to two DTAKITs can be connected to one line (will show as one point on the control panel). As an alternative, one DTAKIT and an additional ceiling pull can be fitted to one line. DTAKIT: toilet alarm three-part kit – white. DTASKIT: toilet alarm three-part kit – stainless steel. DTACP: ceiling pull – white. DTASCP: ceiling pull – stainless steel. DTAODL: overdoor light/sounder – white. DTASODL: overdoor light/sounder – stainless steel. DTARP: reset point – white. DTASRP: reset point – stainless steel. If this is not what you are looking for you might like to try our Omnicare loop wired EVC system. 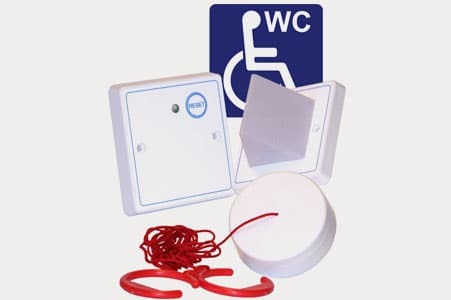 Disabled toilet alarms for individual toilet cubicles can be fitted with our 4-way control panel and disabled toilet alarm kit. 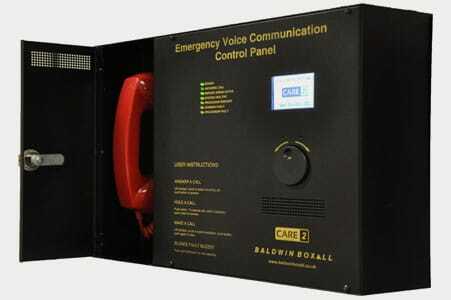 For more information on Care2 EVC system products.